Interaction Design is about imagining and creating innovative systems, products, and services that communicate with people. It deals with crafting exceptional experiences for users and inventive interfaces that are both scalable and sustainable. Since the outcome of good Interaction Design is a high-level of customer satisfaction, it has become a crucial part of UI/UX design. Interaction design encompasses UI, UX, usability, human factors, psychology, and understanding the digital world and its technologies, to create a high level of customer experience. As such, Interaction Design courses are highly sought after in India and all over the world. With Interaction Design jobs on a steady rise, it is essential for design aspirants to imbue in themselves skills that are in-line with the needs of the industry. Here are 10 skills that an Interaction Designer should possess for a rewarding and lucrative career. Design is all about people – what they like, what they want, and what will help them. Put yourself in the user’s shoes. Would you use the product? Is it adding value? Does it serve its purpose efficiently? If you answer no to any of these questions, then your users too will reject the product. Positive user experience is the result of listening to what your users need and understanding their behaviour and emotions. Having an amazing website with a beautiful interface and flowery content is of no use if the website is not user-friendly. You have to listen to what customers are saying about your products, about your competitors’ products, about what they actually want and include them in your design. Finding creative ways to solve a problem is one of the key purposes of design. Creative thinking is the first step to finding solutions to an existing or new problem. Users are always on the lookout for new and exciting products in the market and creative thinking can help you fulfil their needs satisfactorily. Critical thinking is all about analysing if your idea is tangible or not. Because, what looks good may not necessarily work well. You should be able to think why a solution works and why one will not. You have to use logic and reasoning to ensure your product does what it is supposed to. Trends in design change by the minute. It’s all about staying ahead. Market research is an essential part of Design. As such, Interaction Designers should keep their eyes and ears out for the latest trends in design and technology to apply them effectively. There is a lot of research that goes into designing a mobile application or website no matter how simple it is. You have to meticulously study UI/UX design trends, user behaviour, colour psychology, programming, etc. to create a product that is both aesthetically and functionally pleasing. Visual design forms an important part of how your ideas are implemented. It is at the heart of Interaction Design and shapes the very core of its being. Interaction Design involves the visual representation of an idea. You will be creating icons, infographics, presentations, prototypes, mock-ups, wireframes, storyboards, and templates. It deals with the actual design of the product / system / service. Interaction Designers are also master storytellers who have to articulate their ideas visually to an audience. Hence, it is absolutely essential that you are proficient in visual communication. Before your design goes into deployment, you have to first test if it actually works as intended. This is standard procedure in any design environment. A wireframe is the blueprint of your design. It lays out the structure and layout of the application, page or system. Prototypes are working models of your design. They contain actual content and function as the product is intended to. You should be able to create wireframes and prototypes and test them thoroughly before they are deployed. This will allow you to enhance the experience based on testing inputs and help you design a better product. Analytics does not mean you will be crunching numbers and sitting in front of an Excel sheet all day. Interaction Designers use A/B testing to gain valuable performance metrics of their websites or applications. Data from A/B testing is used to analyse user behaviour and optimize their designs, which will yield the best results. Therefore, you should be well-versed in the analytics side of design. Data-driven designs are far more insightful than designs that are mostly aesthetic. Analytics will help you assess the user’s journey. By including analytics in your work, you will be able to create enhanced designs that offer better experiences and outcomes. Designers are no longer confined to their drawing desks. Today’s designers are powerful decision-makers who have a say in the company’s business strategy. Interaction Designers should know the goals of the organization in order to design products accordingly. Understanding how your designs impact the overall growth of your organization can put you at an advantage over your peers. Being business-savvy means demonstrating the ability to collaborate, plan, and lead teams to achieve business goals. While it is imperative to have highly proficient research and design skills, it is equally important to have good communication skills. You should be able to convey your ideas to your team and all supporting teams to ensure they comprehend what needs to be done. Communication skills are especially vital for independent designers and freelancers. You should be able to pitch your ideas through efficient and engaging storytelling to investors and other stakeholders in order to clinch the project. Knowing how to present yourself, speak confidently, and articulate your design ideas effectively is key to becoming a world-class Interaction Designer. Great Interaction Designers do not have an egotistical mindset. They are neither rattled by negative feedback nor do they see it as an attack on their skills. Instead, they constructively use customer feedback to better themselves and the products they design. Thus, to become an excellent Interaction Designer, you too have to develop an open-mind to customer feedback. Interaction Design courses in India are usually packaged as UI/UX design courses, but there is a distinctive difference between the two. Most UI/UX design courses cover the technical side of design and rarely touch upon its interpersonal facets whereas Interaction Design courses cover the entirety of what exactly design encompasses. 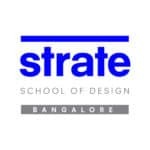 The Master in Design program from Strate School of Design with a specialization in Interaction Design aims to imbibe these values, capabilities, and skills in aspiring designers. The program is a comprehensive guide on the emotional, relational, and technical aspects of Interaction Design.